Major media likes to talk about China (Communist China, anyway) as the rising force of note in Asian affairs, whether one means trade, finance, or technology, and as a result the United States is often cautioned to stay on the good side of Beijing. But Isabel Hilton, writing for the Guardian, explains the matter concisely and with moral conviction. Simply put, the People’s Republic of China is not answerable to their people, serves in no way as a republic as most nations define it, and has only the brutality of the worst autocratic regimes in common with any of China’s history, and none of traditional Chinese values. Unless and until that changes, the PRC is merely an unstable oligarchy with a nice veneer hiding the blood stains. Human Events Online has presented an interesting collection. Where most publications occasionally print a list of papers and books they recommend their readers acquire and read, HEO has produced a list of the “Ten Most Harmful Books of the 19th and 20th Centuries”. The lesson HEO is pressing, is that ideas have influence and power, and ignoring dangerous falsehoods allows them to become dominant. What strikes me as interesting when I see that list together, is how innocuous many of those titles are. Some even sound reasonable, until you find out the propositions set forth within their covers. Evil is sometimes very subtle. Assuming that Mr. Woodward’s vouchsafe is sufficient proof, the media has begun the obligatory Liberal praise for former Deputy Director of the FBI, W. Mark Felt, for leaking information against President Richard Nixon to the Washington Post through reporters Woodward and Bernstein. “Hero” is a common word used for the former lawman, as though Felt should be held in equal or higher regard than, say, Marines currently serving in Iraq. I can’t help but believe that to many in the press, this is indeed how they see the matter. Certainly, Richard Nixon’s conduct while President is inexcusable at times, and the tapes only reinforced the unsavory nature of Nixon’s anger against Democrats and the media. It should be understood, however, that Nixon’s aides played faction games against each other (remember Kissinger and Haldeman? ), and in some cases the charges Democrats levelled against Nixon may have been redirected from the original culprit, to a more desirable target. Most people examining the Watergate scandal do not consider that President Nixon never had appropriate counsel; by the time Congress went after Nixon, Dean and Michell had already deserted him and madetheir own deals. With that in mind, consider the conduct of Mr. Felt. As a Deputy Director of the FBI, Mr. Felt was a lawman, and answerable to the same code as any FBI agent. That is, if he found evidence of a crime, he was morally and legally required to bring it to his superiors’ attention. Did Mr. Felt contact the FBI Director? No, he did not. Did Mr. Felt notify the Attorney General? Again, no he did not. Did Mr. Felt submit his evidence to a Grand Jury, or to his Congressman? Once again, Felt made no attempt to provide this information to any law enforcement or justice authority whatsoever. Instead, FBI Deputy Director W. Mark Felt conducted a personal vendetta against the President of the United States, passing along what he felt like telling, to Mr. Woodward, knowing the information would be printed as unchallenged fact, without any corroboration whatsoever, and without any sort of opportunity for the President to have an opportunity for rebuttal. This continuing action was in direct and deliberate violation of law and code. In a Letter to the Editor of the Houston Chronicle, reader Jay Bute of El Lago hit the matter directly on the head when he asked whether, considering that a top FBI officer had complete control of what was released to the press, it might be possible that Felt could present whatever evidence he wanted in whatever manner served his personal interest and worse, could suppress or destroy evidence which might favor the President? At best, Deputy Director Felt violated his oath, obstructed justice, and violated the constitutional rights of Richard Nixon and his Administration. At worst, Felt damaged the entire balance between the Legislative and Executive branches of government, by usurping the process of investigation in order to attack a man he personally disliked. While the Liberals cheer on Mr. Felt, keep in mind this basic fact: They are cheering a dirty cop. 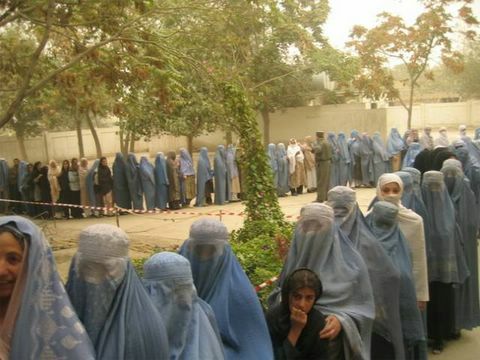 Women voting in Afghanistan. Just one more thing that happens when 50 million people are freed from tyranny, because George W. Bush sticks to his principles. The Federal election of 2000 casts long shadows, it seems. Actually, that’s not true, but the election was one representative event, where partisan tensions rose and left scars on the nation. Republicans were bouyed by George W. Bush’s Presidential win in 2000, along with control of both the House and Senate in the Congress, and so came to think of the conflict as a hard-won victory, and they looked forward to enacting legislation as the clear majority party in power. For their part, the Democrats bitterly resented their losses in the national contests, all the more when they saw a trend in the draining away of their power. When the United States Supreme Court ruled against the Florida Supreme Court’s attempt to subvert the election and their State Constitution, Democrats saw the defeat as a sign that they had fallen on all fronts. Since the 2000 election, things have gotten only worse for the Democrats, as they are now losing not only national offices, but governorships and voter support in party affiliation. With the disgrace of Dan Rather and Jordan Eason, Democrats are also seeing the fall of their cherished icons in the public media. During the first session of 2001, Republicans in the House of Representatives tried to put together the promised agenda of legislation, but found themselves stymied on three fronts: First, President Bush acted with something less than bold confidence because of the close numbers of his election. Second, the Senate reversed opportunity not only because of the mercenary defection of Jim Jeffords, but also due to the historical egotism and narcissism of the Senators as a group. But third, the House also found it unexpectedly difficult to reach consensus on some of the most important bills. The Republicans were finding that majority as a party did not translate to unity on their priorities and promises. So began the first term of President George W. Bush. Since then, the Republicans have enjoyed surprising victories in the 2002 Congressional elections, and in the 2004 Federal elections, but still face the inertia that faced them four years ago. True, there was the tax break vote, and the stunningly bold action which has freed two nations from despots, and which still holds the potential to remake the future of the entire Middle East. There is also the resolute decision to put up with stalls in Congress, rather than play the games Democrats used against the first George Bush, which would provide short-term amity but weaken the nation and the party. But the Republicans are finding that every battle has a sequel, and promises made to get elected are not always remembered by the men who make them, no matter how noble the words. Just as a Democrat majority in Congress did not give Bill Clinton everything he wanted, a Republican Congress will sometimes put itself ahead of the President and the Nation. While the Democrats fight the growing trend of Conservative values, the Republicans fight a stubborn system of entrenched personal egos and the status quo. A common frustration, even for two parties moving in different directions. One thing I have always found difficult to understand, is why it is that a fact obvious to most people always seems to miss a few, and almost always the people who need that comprehension the most. Denial is a common human failing, but even so it is baffling to see people deliberately ignore the source of their difficulties, and the key to their correction. In American politics, the Liberal mindset is doing their level best to impersonate lemmings as their party implodes from the force of Logic pummeling against their platform. And yet, even now the Liberal mind seeks ways not to correct their errors, but to justify them. This is bad news, because America has always been best run under the balanced influence of both Conservatism and Liberalism, and always with Reason at the helm. If one of those ends is lost from the government, the resulting imbalance is going to prove unpredictable, and eventually result in regrettable events. Paul Starr wrote an interesting piece in the “The American Prospect”, which he calls “The Liberal Project Now”. I read the piece hoping to see an honest discussion of what has gone wrong with American Liberalism. While that was not what happened the article is an interesting look into the Liberal mindset. Predictably, Starr begins with the vague and invalid accusation that the Republican Majority represents “a shift in partisan control of the federal government”. Taken literally, those words are true, but they were even more true when FDR and LBJ enjoyed overwhelming majorities, with effectively no balance from the Right, leading to serious errors which are only now being properly addressed. Starr starts down the emotional and invalid path, when he claims that Conservatives are “devoted to dismantling the constitutional and fiscal underpinning of liberal government”, which in truth amounts to petty whining that a Republican majority means to govern with the mandate they received, just as happens anywhere when a political party is given the authority to do its job as it sees fit. I found this quote by Starr especially telling: “When historians and social scientists in the ‘50s said American politics reflected an ideological consensus that was liberal at its foundations, it was the absence of any socialist challenge that they mainly had in mind.” What that statement actually told me, is that academics concluded that FDR’s control of the federal government was so complete, that even the election of Eisenhower as President and a Republican Congress could not immediately turn the nation from its Leftist agenda and course; the Liberals victory had been so complete for a generation, that alternatives were not seriously considered. Starr is not completely blind to the fall from power by Liberals, but he misses the root causes. Even as he admits that Liberals have only recently “faced the possibility of being totally excluded, not just from power but from any influence or access.” Now really, I am as big a fan of Dubya as anyone, but even I stop short of saying he has telepathic mind control, which is essentially what would be necessary for the Conservatives to have so wedged the door against Liberals. The truth is better news for Liberals, and much worse. The good news for Liberals, is that Conservatives do not have nearly the total power that Starr pretends here; the bad news is that Americans have rejected the worst of the Liberal agenda, and the stubborn refusal of Liberal Leadership to see that most Americans will not tolerate extreme Liberalism any more. A Pew poll in 2004 revealed that fewer Americans than ever before consider themselves ‘Liberal’ (as a percentage of the voting population), while Conservatives are on a long rise in not only support, but voter identification. It’s no accident that Florida and Texas, once both considered Liberal states, are increasingly Conservative, and it’s no fluke that the Governor of California is a Republican. Starr says the job of the Liberal Leadership is “to make liberal government bolder, and to get its leaders to take political risks”. Sorry Mr. Starr, but that was what the Liberals tried in 2002 and 2004, and it just does not work. A truly bold liberal would be willing to take a long hard look at why your policies are rejected, not only by the President and government in office, but by a majority of Americans. “Liberals certainly need to defend liberal accomplishments and oppose conservative measures” demands Starr, but that simply is not wise. There are no liberal accomplishments of note, only a petulant denial of real needs and crises, and a refusal to face the fact that the only plans of action are coming from Conservatives. As for opposing Conservatives, why oppose a plan simply because a Conservative presents it? Unless and until Liberals accept reasonable measures offered by Conservatives, and unless and until Liberals can offer realistic and functional alternatives from their own platform, they will be hurting their own future to play the spite card as they have been doing these past five years. Starr trips over a useful element is rebuilding Liberalism as a political option, when he writes “Rebuilding a Democratic majority will require a broad and inclusive politics and the acceptance of ideological diversity within the party”. Starr neglects to consider the recent history, though; The GOP accepts Pro-Choice Republicans as legitimate and equal to anyone in the party, while the Democrats shut down any Pro-Life members in their party. The GOP accepts party members who worried about the War in Iraq, while the Democrats refused to stand behind the President just a few weeks after 9/11. The Conservatives walk the walk, and the Liberals whine. Starr proves he doesn’t understand the nation’s barometer when he claims there is reason to believe that Americans would value a party “committed to the constitutional principles in force since the late 1930s”, which is Liberal code for the court-packing tactics of FDR, and the subsequent court activism which created two new branches of heavy taxation in violation of any Constitutional mandate, to say nothing of a progressive tax system so cumbersome and punitive, that a majority of Americans has supported the disbanding of the IRS for more than forty years. Starr yearns for a Socialist America, never realizing that ideology died with Stalin. /\/\/All through the movies, we heard it; ‘May the Force be with you’. But who thought through what it means, for the Force to be with a person? One important aspect to the Force which is missed by many, is that the Force moves and acts, almost with its own volition, and while a person may believe they are acting independently of the Force (a la Han Solo), this is not really the case. The Force, however one wants to define it, is so intrinsic to human life, that it is impossible to say that the Force is not part of our very identity. And anything which is part of our identity, is a factor in our decisions and actions. Anyone who has tried to walk down a street when the wind was blowing hard into their face, understands that direction is sometimes critical. And most of us have looked back with regret to a decision, where we ignored a signal from our gut and later realized we should have heeded it. Sensitivity to the Force and learning its communication is a skill developed through practice and careful meditation. The first step is realizing the Force has a direction and can serve a greater purpose. If you think the New York Times really does print ‘all the news that’s fit to print’, you might want to skip this article. If you believe Dan Rather’s support of forged documents in an attempt to influence the 2004 U.S. Presidential Election was good journalism, this might make you very unhappy. And if you think that Eason Jordan was just trying to be what all journalists should aspire to become, just move on to a blog in your own part of the universe. What I mean is, the Blogosphere has now officially moved beyond the shores of the United States and Internet-only discussion, to the point where it now must be counted as a measure of political influence and policy direction by nations around the globe. Late last week, I was contacted by an editor of the Kyodo News consortium, which is one of the largest news reporting syndicates in Asia, and is distributed to almost every newspaper, radio, and television station in Japan, South Korea, Taiwan, and the Pacific Rim. I was later interviewed by Mr. Toshimitsu Sawai, who is preparing a story about the early contenders for the U.S. Presidential Election in 2008. Mr. Sawai and I had a pleasant discussion about the qualifications of Dr. Condoleeza Rice for the office, along with speculation about her likely rivals in the Republican and Democrat parties if she chooses to run. We also discussed the significance of the Bush Doctrine in Asian affairs, how it affects trade agreements, national security, and regional alliances. Mr. Sawai is also interviewing a number of other political authorities, and I look forward to reading his story. The significance of this interview, lies in the fact that Kyodo News did not restrict itself to the Mainstream Media in developing the story and finding sources for comment. Bloggers are now considered valid political authorities. I wonder how long, before a major blogger wins a national office? It seems much more likely, indeed much closer, now.